I'm actively adding something positive to June, by participating in #growjune on twitter. 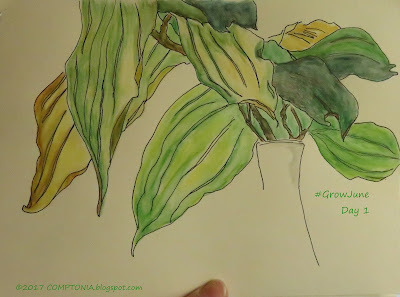 It's a monthly art challenge; people try to post a new piece each day, with either a certain theme (like #growjune) or in a particular medium (like #paintSeptember). Running a hashtag search instantly displays everything that has been posted each day. The results are varied and interesting! It's just a fun way for people at any level to share work and encourage each other. If you feel like jumping in, let me know! I may not manage to post something every day in #growjune - but I will try. It's very satisfying to look back and see seven or twelve or twenty-five pieces in a month.